To indicate the movement in the Russian language there are many options - "идти" (to go), "бежать" (to run), "ехать" (to move by transport), "лететь" (to fly), "плыть" (to swim), "ползти" (to crawl, to creep), "лезть" (to climb), "брести" (to plod, to dawdle). And all these words mean movement in only one direction. To move in different directions or back and forth, other words are used. 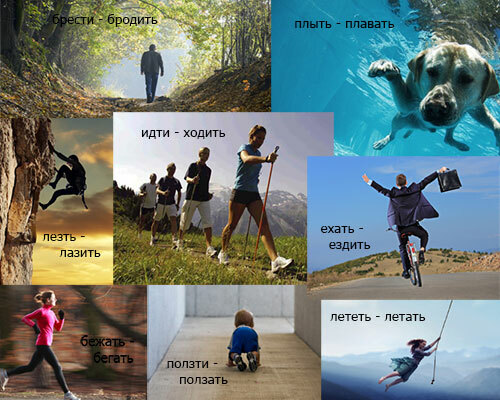 In Russian language there are 14 pairs of verbs of motion, that is 28 words. They are divided in the direction of movement and in the mode of motion, and also there is a subject moving without an object or with an object (like "нести", "везти", "вести" - to carry).